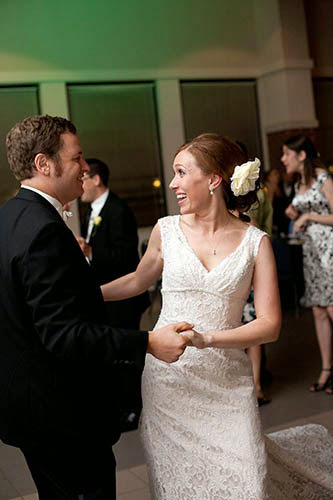 Two years ago, when I was celebrating our first wedding anniversary with the first wedding week, I wrote about how Mr. P and I seriously weighed our options (and our budget) to decide when to call in the professionals. 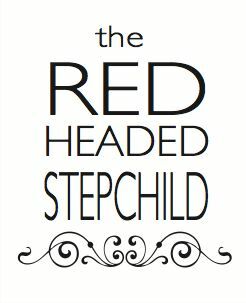 I love DIY as much as the next blogger, and I had an absolutely redonkulous number of projects for or wedding. But I couldn’t do everything, and I knew some very important things just needed to be left to the pros. And one of those very important things was an all-ages, everyone having a good time DANCE PARTY. So yes, we spent a good chunk of change on a DJ and emcee; no borrowed audio equipment and no iPod playlists for us. “But this is a DIY wedding week, it’s RIGHT THERE in the title,” you’re saying. Yes. That is true. However, having an awesome dance party was so important to me that I didn’t relinquish control entirely. We made several executive decisions to make sure our dance party came to fruition, enough that I feel like we did do a lot ourselves. So while I don’t have tips for how to wire up a sound system or make iTunes deliver on the big day, I can tell you how to ensure you have a hopping dance party... in five easy steps. For us, this meant: NOT A BAND. 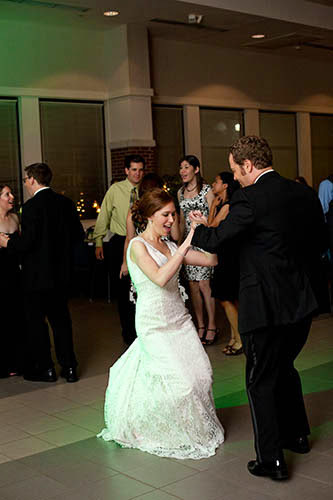 Now, bands are great for some receptions – if your wedding guests aren’t really ones to shake their booties but will maybe hit the floor for partner dances, then by all means, drop that dough on a wedding band. That will be money well spent. However, I was fairly sure that there was no wedding band that could drop the beat to Usher’s “Yeah”. So, DJ it was. My favorite musician has been, for as long as I can remember, Ben Folds. 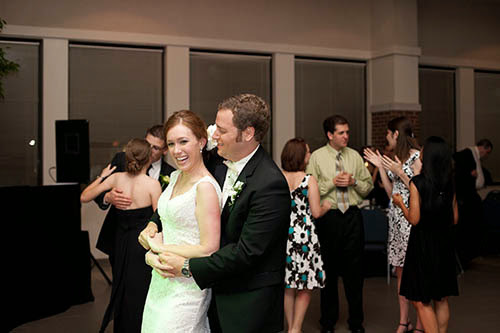 Was there a single Ben Folds song at our wedding? No. 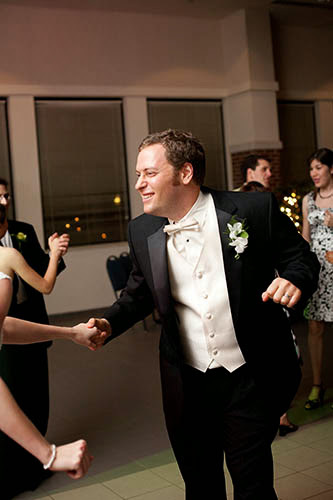 Because he doesn’t really play wedding-dancing music, and as much as I love Ben Folds, I would love our wedding guests to be dancing more. So we played music that I don’t listen to every day. Black Eye Peas, Bon Jovi, even Miley Cyrus (Party in the USA, y’all, summer song of 2010!). That gets people out on the dance floor a lot more than Broken Social Scene or Regina Spektor. I put a lot of thought into songs that I love to dance to, even if I don’t listen to them normally. And it worked, people got out on the floor! We opened the night with Hall & Oates “You Make My Dreams Come True” – something everyone from teenagers to my parents could appreciate and at least tap their feet to. Later in the night we brought out more modern stuff, but still those songs that you don’t have to know to love dancing to them. One of my favorites? Christina Aguilera’s “Ain’t No Other Man”. The beats start to drop about thirty seconds into the video below – and how can you not shimmy to it? We had a few, but the biggest by far was the Cha Cha Slide. And yes, it filled the floor. Everybody clap your hands! EVERYBODY! This goes hand-in-hand with getting over your musical snobbery. 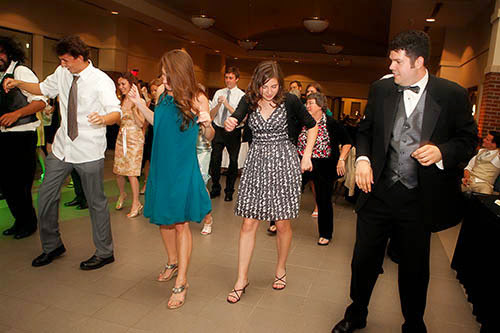 You can skip the group dance because you think it’s silly, or you can go for it and get people that will otherwise be seated for the entire reception on the dance floor. If you have a DJ, they’ll suggest it. DO IT. 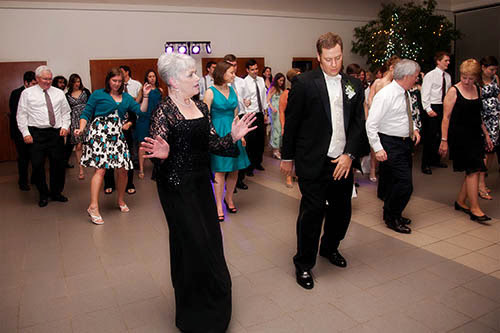 Because when else am I going to get to see my mother and husband bust moves like this alongside each other? Tip 4: Listen to the radio. A lot. So listen, take notes, and when it’s time to create your playlist (for your own iPod or for your DJ), you’ll be ready with all the best songs to get everyone on the dance floor. 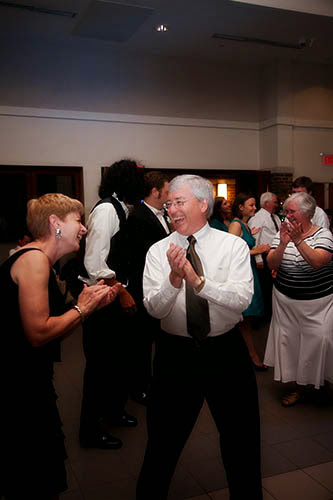 Tip 5: If you are the bride or groom, DANCE YOUR HEART OUT. 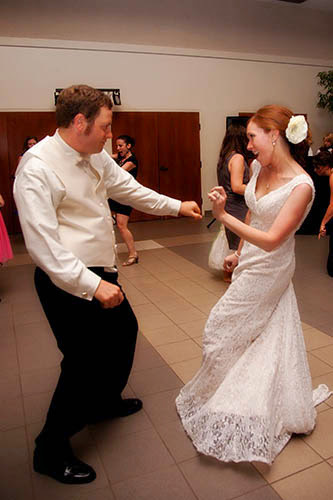 Fact: the best wedding dance parties are the ones where the bride and groom are tearing. up. the. floor. We told our DJ/emcee company that we wanted a great dance party, and they gave us a few tips (like the group dances), but they told us that the thing that would help get people dancing the most is by dancing ourselves. It makes sense: you can’t expect people to do something you can’t/won’t do yourself. 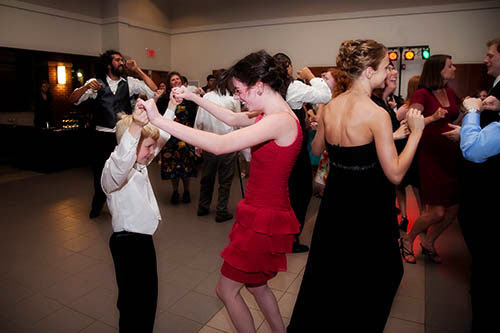 And if the bride and groom are on the dance floor, it’s The Thing To Do. And it worked, it totally worked! Bonus: we had a total blast ourselves. So by now, if you don’t believe that our dance party was at least partially do-it-ourselves... check our all those photos up there of Mr. P and me working hard to the beat! A band, a DJ, an iPod can only do so much... the rest is up to you. So much fun to look through all these pictures! And I must point out that one can NOT shimmy, but more for lack of skill than from feeling moved by tunes. Can I employ you for telling me what the kids are listening to in Spring 2014? I cannot get over how well(?) everybody showed up in the pictures! The lighting was not that bright!!! It was dark enough to make one feel secure enough to get up and dance like no one was watching... seriously. Glad I didn't know then what I know now - because it was one great party! P.S. Thank you, Dear One, for not posting more pictures of TMOTB - I held my breath scrolling through the whole post... ha! I forgot to add my unself-centered comment, too... those DJs were fantastic for moving the entire reception along - they knew how to work the guests into having a great time and keeping them informed as to what was going on; i.e., making introductions from the first dance to cutting the cake right on through to the last dance and your departure. 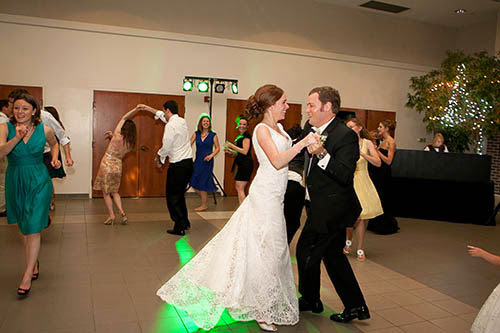 Those DJs didn't just play the music y'all chose, they choreographed the entire reception! Fun, fun, fun! Our DJ company let us pick songs that were "Must Plays," "Would Be Nice to Hear," and "Do Not Play." The "must plays" would be for special songs for the couple or families or whatever, the "do not plays" were for Macarena or Fix You which trigger strong non-reception-worthy emotions (even if someone requested it), the rest were up to the DJs discretion to play. So, we added a bunch to the request category and had a good time. Another thing to consider with DJs is their experience. While you're running around trying to say hi to everyone and eat and be surrounded by love, it's hard to look at a clock and say, "Ok, time for cake cutting!" So, get someone who can stay on top of those things and help move things along at a good pace (and leave the venue before closing time). You can't read the room as well as they can while you're bouncing from table to table or shaking your own booty. I'll be around for all the anniversaries!